Small, ultra-high-tech companies such as Aeron Systems that are attending Defexpo 2018 in Chennai from Wednesday, are hoping to benefit from Defence Minister Nirmala Sitharaman’s assurance that micro, small and medium enterprises (MSMEs) would form the core of a galvanised defence industry. Aeron Systems, founded in 2008 by Ashvani Shukla and Abhijit Bokil, two electronics graduates from Pune, is looking to contribute to programmes such as the Tejas light combat aircraft and the Future Infantry Combat Vehicle (FICV). Aeron operates in the rarefied realm of inertial navigation systems (INS), a complex package of motion sensors and computers that allow moving objects - whether a spacecraft, missile, unmanned aerial vehicle (UAV), aerial bomb or a land vehicle - to continually track their own location with an accuracy of just inches. INS is distinct from satellite navigation, which allows moving objects to glean their own location using signals from a network of satellites called the Global Navigation Satellite System (GNSS) - a more accurate version of Google Maps. GNSS includes satellite networks from several countries - the American Global Positioning System (GPS), Russia’s Global Navigation Satellite System (GLONASS), the European Galileo and China’s Beidou. Most such networks allow all users to access a less accurate “commercial signal”, while reserving the highly accurate military signal for their respective militaries. In the Kargil conflict in 1999, India’s military experienced problems in receiving GNSS signals, prompting the establishment of an Indian satellite constellation called IRNSS (Indian Regional Navigation Satellite System). In addition, India’s GAGAN system - short for “GPS And Geo-Augmented Navigation” - uses ISRO satellites to augment the GPS commercial signal, enhancing accuracy to close to military grade. However, satellite navigation is unreliable. A satellite signal can be lost because of weather, or while traversing dense foliage or tunnels or in mountain valleys. Signals can be deliberately jammed by the enemy, or spoofed (a false signal created) to divert a missile or UAV from its intended course. Furthermore, satellite signals are updated only once a second. A missile or aircraft that could be travelling 500 meters per second needs location update data 50-100 times every second. That is why critical systems like ballistic missiles, fighter aircraft or the FICV would navigate primarily with INS, using GNSS as back up. An INS system uses multiple, data inputs - including a high-tech gyroscope - for navigation and control. The data is fused into an output that minimises navigation errors. A company’s core skill and intellectual property lies in the accuracy of its data fusion algorithm. India’s Defence R&D Organisation (DRDO) spearheads INS development for India’s strategic missiles. Meanwhile, Indian Space Research Organisation (ISRO) develops INS for space applications and spacecraft. Neither have resources to build INS for other crucial applications like fighter aircraft, land combat vehicles and mine-laying. Consequently, notwithstanding the lip service to indigenisation, many Indian platform developers continue to rely on foreign INS, with little done to indigenise these crucial devices. Ashvani Shukla says the technical specifications for the FICV’s INS mandates a “Hemispherical Resonator Gyro”, which is only made by French company, Safran, and US vendor, Northrop Grumman. “We provide an equally high-performance INS, but get ruled out of the project on technical grounds,” he says. Similarly, an INS that Hindustan Aeronautics Ltd (HAL) builds under licence from Safran, is fitted on almost every Indian Air Force aircraft. “Safran has given HAL technology for licence manufacture, so they effectively enjoy a monopoly,” says Bokil. 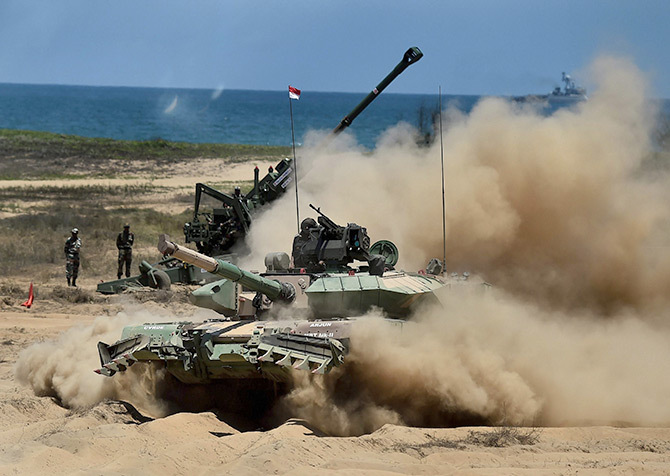 In another example, Bharat Forge is also using a Safran INS in the Advanced Towed Artillery Gun System (ATAGS) it is developing in partnership with DRDO. “If we were told to build an INS for ATAGS, we would take just 18 months to deliver it”, says Shukla. He hopes to pursue the project under the “Make 2” category, in which the MoD reimburses the development cost of successful projects undertaken by MSMEs. Already, Aeron’s systems are being installed on the army’s mine-laying vehicles, unmanned ground vehicles used for bomb disposal, and on “precision guided” kits for rockets. Aeron has also developed a miniaturised INS that converts “dumb iron bombs” that have been dropped from aircraft since World War I into “smart bombs” that navigate their way from an altitude of 20,000 feet to a ground target 30-50 kilometres away, landing within 5-10 metres of the target. Aeron is a profit making company, turning over Rs 130 million in the last year. But its founders and its 55 employees are waiting to see how much of a boost Defexpo 2018 provides by bringing foreign vendors in touch with Indian industry. Is the Centre discriminating against South India? Govt borrowings: Will there be a pleasant surprise in September?